In spite of a gridlocked Congress, 2011 ended with some very positive legislation for the 2012 Federal Housing Administration (FHA) Loan Program. The local housing market will benefit from higher FHA loan limits and an extension of the FHA Anti-Flipping waiver. Thanks to the support of Antelope Valley Congressmen Howard “Buck” McKeon (R-CA) and Kevin McCarthy(R-CA) H.R. 2112 was passed by the US Congress which includes a provision to reinstate the FHA loan limit in high-cost areas for two years. The higher Fannie Mae, Freddie Mac, and FHA conforming loan limits of $729,750 expired Oct. 1, when it was reduced to $625,500. The passage of H.R. 2112 provides for an extension of FHA-insured mortgages at the higher level of $729,750 in high cost areas, including Los Angeles and Orange counties, through December 2013. Unfortunately, The US Senate and House could not agree on increasing the loan limits for Fannie Mae and Freddie Mac which marks a historic change in the long enjoyed higher max loan limits which were previously dominated by Fannie Mae and Freddie Mac. 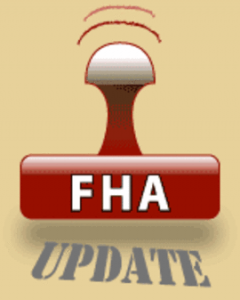 In addition to the gift of higher FHA loan limits, FHA has also announced the extension of its “anti-flipping” waiver through the end of 2012, which allows buyers to purchase homes that have already been sold in the last 90 days. The waiver, which was set to expire on December 31, 2011, has been extended through December 31, 2012. An anti-flipping rule originally took effect in 2003 to stop a spike in home flipping that was being blamed on driving up home prices during the housing boom. The rule prevented FHA-backed loans from being used to purchase homes that had been owned by a seller for less than 90 days. But the U.S. Department of Housing and Urban Development decided to reconsider the 90-day limit in 2010 after skyrocketing foreclosures and abandoned homes were causing blight in neighborhoods across the country and hampering nearby property values. The temporary waiver to the anti-flipping rule will allow buyers and investors to quickly resell refurbished homes and not have to wait 90 days to do so. Since the waiver took place in 2010, FHA has insured nearly 42,000 mortgages worth more than $7 billion on homes resold within 90 days of the last purchase, according to HUD. The 2012 extension includes requirements that flip transactions be arms-length transactions and requires sellers to document improvements to properties to justify profits in excess of 120% of the seller’s acquisition price. This entry was posted in FannieMae/FreddieMac, FHA Information, Legislation, Loan Guidelines and tagged 2012, fha, flip, flipping, limits, loan by gopdean. Bookmark the permalink.